For any individual that is searching for a party bus in Grosse Ile Township, then you will be pleased to hear that your initial search has now come to an end. Here at Rockstarz Limousine and Party Bus, we not only specialize in providing our clients with a stunning party bus, but we also make sure that each and every person present has an amazing time. Our Grosse Ile Township party bus rental option is easy to understand. Basically, you get your own private nightclub on wheels as you cruise around town having an amazing time with family and friends. Also, we have sought to make the maximum use of the space available leading to you being able to invite even more people than before. 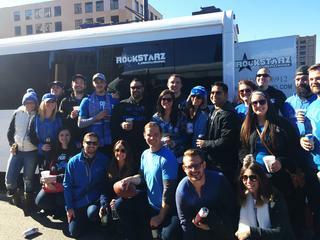 In addition, our party bus is fully equipped with the best items to really help your party to go off with a bang. From the stunning décor to the amazing atmosphere that is created by our sound system and laser display, you will undoubtedly be left in awe of what you see before you. Previously, individuals have sought to use our Grosse Ile Township party bus service to help them celebrate a wide range of occasions. No matter if it is a birthday, an anniversary of some kind, of even just the desire to have a cool party in a cool location with your friends, we can accommodate you with each and every occasion. So, if you do live in the Grosse Ile Township area and are indeed currently looking for a party bus, then you can give us a call here at Rockstarz Limousine and Party Bus. The other option is to contact us via our website, and a member of our team will then be in touch as soon as possible to discuss your own individual needs and requirements.